That was on March 29, Good Friday. And that is why you haven’t seen much going on at Ant & Anise lately. My mom, Ann, is Eve’s sister. Or was, I should say. I’m not used to the past tense with her just yet. 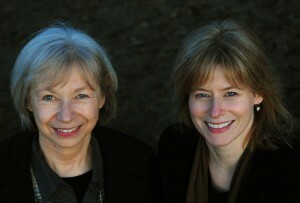 The last few months were heavy going with Mom. 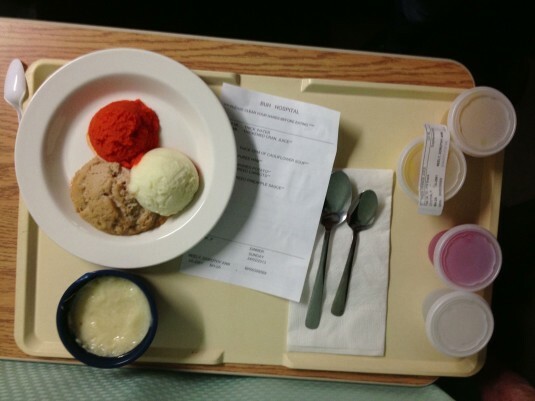 You know when you’re regularly at the hospital and talking with doctors about things like hospice, palliative care and intravenous fluids it’s not much fun. So much energy and focus on decisions to be made. Weighty, emotional decisions. This strange, stressful, emotionally-charged time got me thinking about comfort food, and how important it is when life gets difficult. How (like this article on the psychology of comfort food explains) it has the power to soothe and make you feel better, even if that feeling lasts for only a few fleeting moments. And that brought me to quinoa porridge. It surprised me a little since I lean towards comfort food of the crunchy variety — the snap of a good dark chocolate and the crisp crunch of a really good potato chip…or 20. 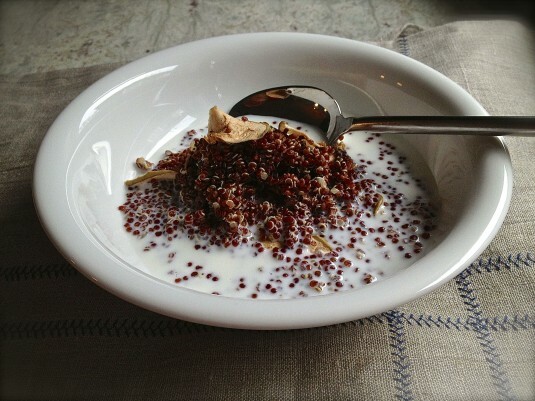 But on those dreary grey mornings before I went to the hospital (dreading the smell and sight of the hospital lunch tray), quinoa porridge was comforting. Kind of like a warm hug that I could only imagine Mom giving me now. Not that Mom was ever very huggy, but it’s a nice thought. The red quinoa I used reminded me of the Sunny Boy cereal that Mom would make, very occasionally, for us when we were growing up. 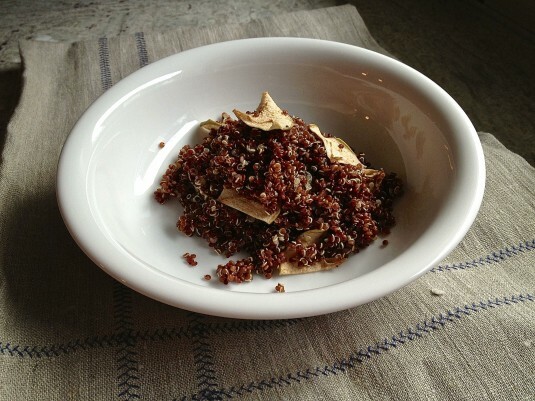 Quinoa (red or white) is more delicate than Sunny Boy or cooked oatmeal — finer, but it still has a hearty texture. I used oven-dried apple and freshly ground cardamom to jazz it up. The oven-dried apple is simple and straightforward, and its soft, sensual texture makes a chewy foil to the crunch of the quinoa. 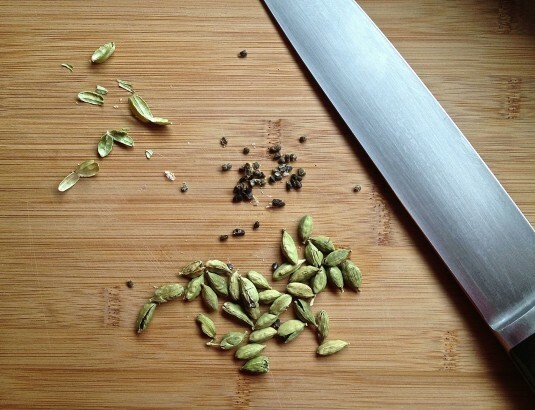 Toasting the cardamom pods and grinding the seeds gave the kitchen a fabulous aroma for hours. 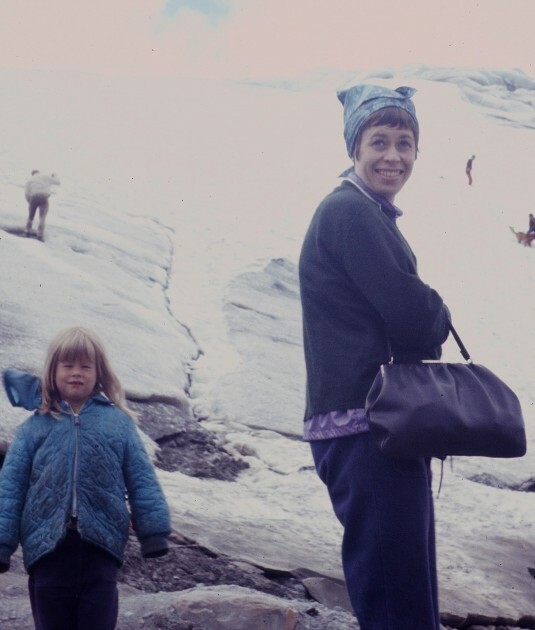 And cardamom’s Scandinavian connection helped me remember Mom in a fond way, with her (and Eve’s, and mine I guess) Swedish and Norwegian heritage. Yes, both the cardamom and dried apple require planning ahead (like the roasted tomatoes which kicked off our blog). But once they’re done, the quinoa itself takes only about 20 minutes. For me it was like a brief respite, a small comfort to take shelter in during this sad, emotionally draining time. 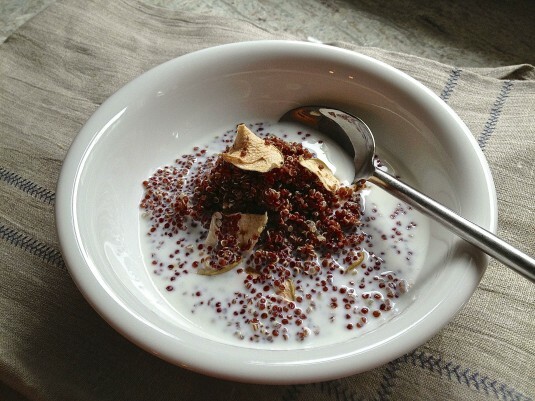 Quinoa is a good source of protein, with 8g per cup (cooked). I used red quinoa but the white variety cooks exactly the same. Most recipes use double the amount of water to quinoa but I cut back the water since I prefer a drier result. Rinse the quinoa with cold water in a fine mesh strainer. Shake off the excess water and place quinoa in a medium sized saucepan. Sprinkle cardamom on top. Add water and bring to a boil over medium-high heat. When the quinoa comes to a boil, cover the saucepan and reduce the heat to low. 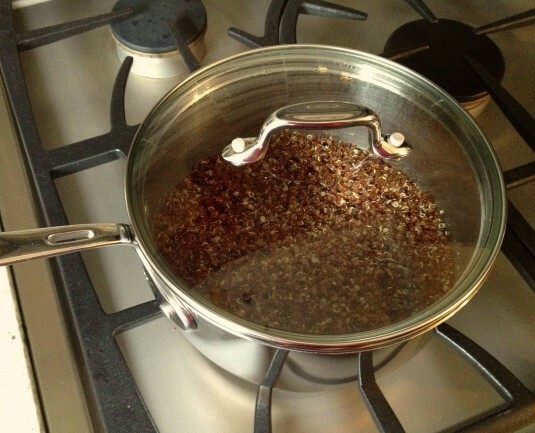 Simmer the quinoa until all the liquid is absorbed, approximately 12-15 minutes. You’ll know it's done when you see a spiral-like germ pop out. Remove from heat and let the quinoa stand for a further 5 minutes. Stir in the dried apple slices. Serve, as is or with milk and brown sugar. 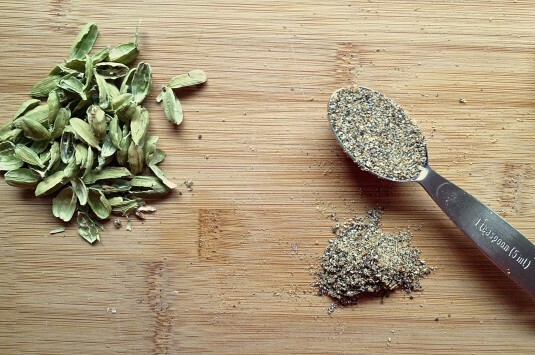 I found that 1 tablespoon of green cardamom pods yields close to 2 teaspoons of ground cardamom. It takes about 10 minutes, all in. Place cardamom pods in a dry frying pan and toast lightly over medium heat, shaking frequently, for 2-3 minutes or until fragrant. Remove from heat and pour pods onto a cutting board to let them cool for a few minutes. Now comes the labor-intensive part: With the side of a chef's knife or cleaver, gently press on the pods to crack them open. With your fingers, gently separate the seeds from the pods. 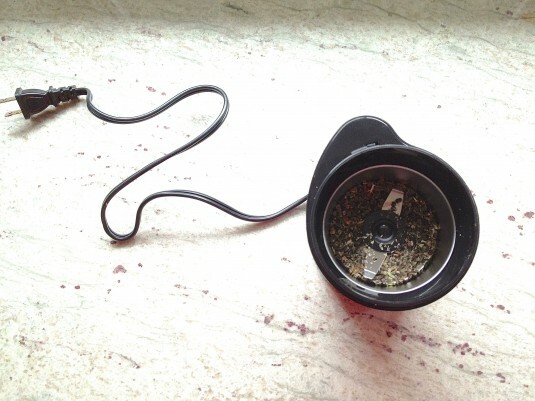 Place the seeds into a small, clean grinder and grind for 30 seconds. Open the grinder up and breathe in deeply...what a fantastic aroma! Store in a cool dry container and use within a week. It’s so hard to rebuild your life after the loss of your mother. Thanks for this thoughtful and interesting post, Kris. My heart goes out to you. By the way, I normally don’t eat porridge. It makes me gag. But I like quinoa. And this sounds really good. I’m going on a canoe trip this summer and was wondering what to eat for a high-protein breakfast when I can’t have eggs. This sounds really good. Thanks! Thanks, Daphne. And I’m with you on regular (=mushy) porridge….can’t stand it! Using less water for cooking is key. On your canoe trip, if you add some chopped nuts to the quinoa you’ll have loads of protein (and added crunch) to paddle for hours. Good luck!